Saturday afternoon was a special afternoon for Kyle Gibson, the Twins’ highly touted rookie righthander. Making his major league debut against Kansas City, Gibson’s first pitch was hit by Alex Gordon. The good news for Gibson is that Oswaldo made a nice catch down the left field line. One pitch, one out. Two pitches later, Gibson got another out, this time on a routine grounder to Brian Dozier. After a line drive single by Eric Hosmer, Gibson faced Kansas City’s Twin-killer, Billy Butler. Butler entered the game with 14 hits in 27 at-bats against the Twins this season. Gibson got ahead on 2 breaking pitches away. After another pitch, this time a ball, Gibson struck out Butler on a nasty 94 mph fastball that ran in on Butler’s hands. After getting out of the inning, an inning where he threw 13 pitches, 10 for strikes, Twins hitters staked Gibson to a 5-0 lead. Justin Morneau doubled in Joe Mauer and Brian Dozier, who had walked. Trevor Plouffe, the Twins DH, fouled off several 3-2 pitches before hitting his sixth homer of the season. Staked to a big first inning lead, Gibson did what he’s done his entire career, attack the strike zone. Though he gave up 2 runs in the third, Gibson dominated the Royals, striking out 5 while giving up 8 hits in 6 strong innings. What Twins fans saw Saturday was a poised power pitcher. They saw a young man whose fastball topped out at 94 mph most of the day. They saw his nasty slider and an effective change-up. At 6-foot-6, they also saw a power pitcher who throws a straight over-the-top 2-seamer. It’s foolish to predict what type of career he’ll have with the Twins. That said, it’s clear he’s got some tools that Twins faithful haven’t seen in a pitcher. It’s also foolish to think the Twins will catch the Tigers this year. They’ll likely be sellers as the trade deadline approaches. Those in the know think the 2015 Twins will be a very good team. By then, the Twins rotation will be anchored by Alex Meyer, Travis May and Mr. Gibson. By then, Miguel Sano will likely be the Twins third baseman and Byron Buxton will be the Twins starting centerfielder. Saturday afternoon, Twins fans got a brief glimpse of that future. By next season, they might be looking at more of that future. That works with me. Members of the House Oversight and Government Reform Committee voted along party lines Friday morning, with 22 Republicans saying she waived the Fifth and 17 Democrats arguing she did not. Lerner remains under subpoena, and the committee believes it could bring the long-time IRS official back and compel her to testify. Rep. Trey Gowdy, R-S.C., reiterated Issa’s argument, delivering a fiery speech about Lerner’s attempt to protect herself under the Fifth. “She’s in trouble. She can be held in contempt,” Dershowitz told “the Steve Malzberg Show” on Newsmax TV. “”You can’t simply make statements about a subject and then plead the Fifth in response to questions about the very same subject,” the renowned Harvard Law professor said. Dershowitz knows what he’s talking about on this subject. He’s literally written a book on the Fifth Amendment. If Rep. Conolly wants to argue that Dershowitz, a lifelong liberal, is saying this to curry favor with Republicans, I’d love hearing that argument. Follow this link for more on this story. The Treasury Department’s inspector general for tax administration (TIGTA) sent a letter Wednesday to congressional Democrats telling them that while several liberal groups may have gotten extra scrutiny, the IRS didn’t necessarily target those — but it did do so for conservative groups. “TIGTA concluded that inappropriate criteria were used to identify potential political cases for extra scrutiny — specifically, the criteria listed in our audit report. From our audit work, we did not find evidence that the criteria you identified, labeled “Progressives,” were used by the IRS to select potential political cases during the 2010 to 2012 timeframe we audited,” Inspector General J. Russell George said. In total, 292 organizations with TEA Party in their names were targeted. A paltry 6 organizations with progressive in their names got additional scrutiny.That’s only part of the story. The 6 organizations with progressive in their names still got their status approved within the prescribed timeline. More than 50 TEA Party organizations have been waiting for over 3 years for approval as a 501(c)(4) organization. Though he acknowledged that his investigation remains incomplete, Werfel said that he had yet to uncover evidence of intentional wrongdoing by IRS officials when applying these BOLOs. Nor had he found instances in which outside actors, mainly the Obama campaign and administration, had pressured the tax agency to target conservative groups. If Werfel doesn’t think that targeting 292 TEA Party organizations to 6 progressive organizations isn’t proof of intentional wrongdoing, then he should be fired ASAP. That’s proof he’s either incapable of being honest or he’s incapable of recognizing reality. In either case, he isn’t the right man to restore integrity to the IRS. Wednesday afternoon on America Live with Megyn Kelly, Juan Williams went off the deep end. In fact, he went off the really deep end. Megyn invited him on the show to debate Marc Thiessen about President Obama’s war on coal agenda. First, Thiessen said that this isn’t about controlling pollution, citing this administration’s report showing that CO2 emissions are the same today as they were in 1992. It’s at that point when Megyn asked why President Obama was implementing this agenda without the consent of Congress. Williams responded, first saying that people had a right to breath, then saying “We can’t let politics interfere” with people’s right to breath. That’s the definition of an imperial president. The Founding Fathers wanted politics to “interfere” with the president’s agenda. That’s why they wrote a Constitution filled with checks and balances. That’s why they chose a republic, not a democracy. As we saw in Minnesota this year, democracy can be hijacked by mob rule. Mob rule isn’t any better than letting a tyrant king issue edicts from his throne. If the minority doesn’t have a say in governing and policymaking, the results head south quickly. What’s particularly stunning is that Williams was foolish enough to admit he, along with other Democrats, love governing through presidential fiat rather than working with Republicans. That’s the worst of it. That isn’t the only negative part of this. Williams is okay with President Obama fundamentally changing the US economy without congressional input. President Obama’s war on coal will kill the economies in Ohio, Pennsylvania, Kentucky, West Virginia, Virginia and Indiana. Juan Williams and like-minded Democrats don’t have a problem with President Obama killing those states’ economies in the name of the environment and public health. In their minds, statistics aren’t important. The Democrats’ agenda is everything to these imperialists. The Constitution doesn’t allow for that. The people are ill-served by government by executive fiat. In short, there’s nothing positive about Williams’ worldview. Former Rep. Allen West, a prominent black Republican, poured scorn on Mr. Winkler’s explanation and said the lawmaker should resign, noting the precedent of cooking-show host Paula Deen being fired and losing endorsement deals for admitting long-ago use of racial epithets. 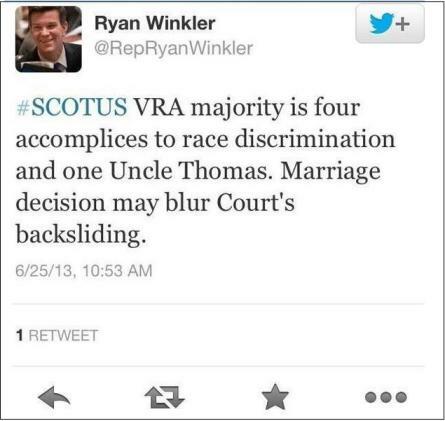 “If Paula Deen must resign so should MN Rep Winkler. Didn’t know Uncle Tom is a racist slur? I’m sick of liberal hypocrisy,” he said on his Twitter account. I don’t think Winkler is a racist. That said, Rep. Winkler has a reputation of speaking first, thinking later. He’s earned the reputation of being a loose cannon who says lippy things that he thinks fires up the DFL base. Saying that he isn’t particularly well-respected on policy issues is understatement. Prior to Tuesday morning, Rep. Winkler had been thinking about running for Minnesota Secretary of State. Those plans died abruptly in less than 140 characters. It’s been awhile since I posted on LFR. Thanks to the second biggest storm that’s ever hit my house, I was without power for almost 55 hours to the minute. The official determination is that we were hit by straight line winds that exceeded 70 mph. Perhaps that’s what happened but I couldn’t prove it by the destruction in my neighborhood. First, I was fortunate. I had three broken branches, 2 of which were ‘politely’ deposited on the roof of my garage. The other is still up in the tree. The house to my north had 2 big branches on its rooftop. The house across my alley lost 3 trees. One tree is still standing, sorta. It’s a box elder that had been there since the 1960s. The house across the street from me lost a monster blue spruce and another tree. The irony is that the home with the most trees down didn’t lose power. Apparently, they’re on a different grid than I’m on. A block to the south of me, the wind snapped off 2 power line poles like twigs. What’s wierd is that they snapped 6-8 feet from the top of the poles. The neighborhood made it through the storm fairly well considering. The neighbors across the street, Brian and Craig, let us tap into their electrical outlet. That helped save almost all of the food in the refrigerator, with a couple of eggs and a thing of breakfast sausage being the only things that went bad in the fridge. We actually ate pretty good during the outage. Saturday, Jim and I ate a couple of steaks made on the grill for lunch. We ate some Hannah Lake walleyes made on Jim’s propane single-burner stove for supper. FYI- Hannah Lake walleye is what our family has called the sunfish and crappies from Hannah Lake for decades. Personally, I’d rather have stayed at a nice hotel with wi-fi, a nice restaurant and electricity than deal with the comforts of home. Though my home didn’t get blasted like it could’ve, I can definitely empathize with the thousands of people still without power, especially those in the Cities. My prayers are definitely with them. Finally, I want to praise the professionals who’ve spent the weekend cleaning up from this nasty storm. The city employees who got rid of the trees that littered the intersections were efficient and informative. The professionals who restored power worked quickly until they had to quit. Work rules prohibit them from working more than 16 straight hours. The team of professionals who restored power came here from Kansas City, MO. It’s impossible to call this weekend fun but everyone got through it ok without injuries. Considering the winds of Friday morning, I’d call that a miracle. First, the school didn’t have the right to tell the student he couldn’t wear that t-shirt. The First Amendment trumps everything else. That should be case closed. Second, this teacher should be disciplined for teaching a student through his actions that the Constitution should be ignored. After that, this student should put the fear of God into this teacher and the school district for violating this student’s constitutional rights.